In what may be the most atypical burlesque event of the week, Sing & Sling: A Musical Burlesque Show will attempt the siren-like feat of luring you in with beautiful bodies as well as enchanting voices. Many of Seattle’s burlesque performers are also gifted singers: Heidi Von Haught, Ella Titsgerald, Olatsa Assin, Sara Dipity, and of course, EmpeROAR Fabulous will show you what they’re made of this Thursday at Rebar. “Being a musician and burlesque performer, the idea for a show centered on singing burlesque performers has been stewing in my mind for many years,” he said. Tickets available at www.singandsling.eventbrite.com/ for $15, or $18 at the door. In order for burlesque performers to shape their routines and improve as entertainers, nothing is more valuable than stage time. Yet to sustain audience interest and quality shows in a super-saturated community, many feel there should be an outlet for working out show business kinks away from the public eye. Still- practice makes perfect, after all. Fresh Meat– which takes place this Friday on the Jewelbox Theater’s cozy, unintimidating stage- is one of a handful of recent events geared toward workshopping and peer reviews. Fresh Meat is a variety-style evening performance open to anyone to attend, but producers and performers are encouraged to come in order to facilitate constructive feedback. A panel of two to three ‘celebrity’ reviewers are invited (established performers or producers with strong backgrounds in arts, theater, dance, music, etc.) to provide written feedback after the show. The idea is to have fun on a small public stage while gaining valuable experience. All levels of performers are encouraged to apply for future shows. Boom Boom L’Roux says that the response so far has been overwhelmingly good, and that she and Ella intend to produce Fresh Meat on a quarterly basis as long as there’s interest. 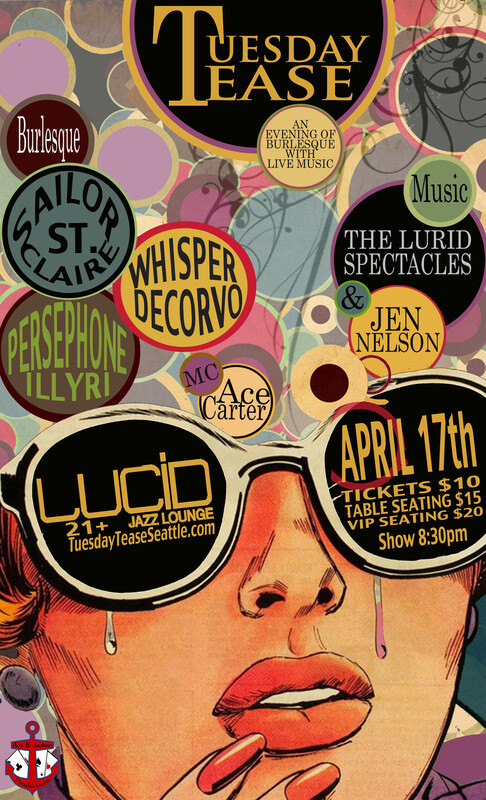 Tuesday Tease launches April 17 at LUCID Jazz Lounge in the U District. The show aims to fill the oft-mentioned need for a regularly scheduled burlesque revue with the added chemistry of live musical accompaniment. Featuring the musical stylings of The Lurid Spectacles (Meg van Huygen, Tyson Lynn, and Jono Green) and a rotating cast of Seattle burlesque artists and cabaret singers, the first show features burlesque by Sailor St. Claire, Whisper de Corvo, and Persephone Illyri with vocals by Jen Nelson and host Ace Carter. Tuesday Tease takes place at Lucid Jazz Lounge in the U District on the 3rd Tuesday of the month in April, June, August, October and December. ~ by angrytruffle on 04/08/2012. oops! don’t forget the lurid spectacles’ drummer, jeff myers!